In the mid-1950s, Gene Hamm was a young golf professional from Raleigh, North Carolina. He was offered head professional at a couple of different courses in North Carolina but neither of those jobs developed as planned. In 1957 he placed a call to Robert Trent Jones and was told that if he needed work, to come on up to Wilmington, Delaware, where Jones was designing a golf course. Hamm traveled to Delaware where he built two courses for Jones. By 1959 Hamm was ready to return to North Carolina and try to design a golf course of his own. 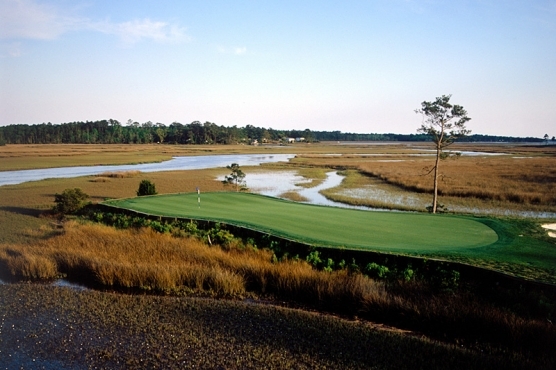 Today Hamm is credited with designing more than 60 courses in southern Virginia, Piedmont and eastern North Carolina and the Myrtle Beach area. He has designed four courses in the Pinehurst area, 12 in Myrtle Beach, including Eagle Nest Golf Club, a dozen or so along the Virginia-North Carolina border in towns such as Martinsville and Danville. He’s done work in many eastern North Carolina towns such as New Bern, Kinston and Clinton, and lists Cheviot Hills, the second 18 at North Ridge Country Club, Wake Forest C.C., Lochmere C.C. and Chapel Hill C.C. among his designs in the Triangle area. Hamm grew up in Raleigh and first learned golf by caddying at the Raleigh Golf Association course. His first job was with Ellis Maples at New Bern Country Club in 1946. After one year, he moved to Pinehurst to work under green superintendent Frank Maples, and later was head pro in Mt. Airy, N.C.
“Back then you had to be golf pro and supervisor of the golf course at the same time,” he says. As a PGA member, a course construction expert, and a member of the National golf course Superintendents’ Association, Hamm has brought a well-rounded background to his design projects. He’s maintained a low profile throughout his career and built courses that remain today playable and interesting, despite being built in the 1960s and early 1970s for less than a half a million dollars. His favorite design, Pinewild, was built for about $2.5 million in the mid- 1980s.